In Ecuador, nearly a third of the population lives below the poverty line. Schools and kindergartens are overcrowded and under-resourced and many disadvantaged families are unable to afford the extra educational support that their children need. As a volunteer on the Projects Abroad Care Project in Ecuador, you will have an important role to play in the lives of these children. We welcome volunteers of all ages and skill levels, whether you are on a gap year, a career break, or a trained professional offering us the benefit of your experience. All you need is to be willing to work hard and be committed to your role and to the children at your placement. 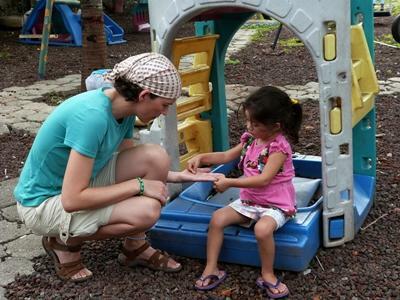 Our volunteers work in kindergartens in the town of Puerto Baquerizo Moreno on the island of San Cristobal on the Galapagos Islands. Although thousands of tourists visit the Galapagos Islands every year, most are focused on the incredibly diverse flora and fauna, and people from the local communities are often given less attention. This is where you can make a hugely significant impact. Although you do not need to be able to speak Spanish to volunteer on a Care Project in Ecuador, learning a few basics will be helpful. If you would like, you can sign up for a Spanish Course in Ecuador before or after your placement. The children at the kindergartens we work with often come from homes where there is little structure and discipline. As a Care volunteer, you are perfectly placed to provide the children with individual support, teach basic life skills, and improve their level of English. Some kindergartens also have children with special needs. Depending on your placement, you may be able to provide one-on-one attention and educational support to these children. We encourage you and all of our volunteers to try new activities and expand the range of games and ideas the children will encounter. This helps promote and enhance their individual growth and development, and the local staff will appreciate your efforts. Working closely with individual children and identifying their areas of strength is a very important aspect of your project. It is crucial that the local residents and future generation get the quality of education they need to secure the jobs in the lucrative tourism industry. The kindergartens where you will volunteer on San Cristobal, are striving to provide the necessary foundation for the future generations. This means that the care work you will be involved with is often quite varied. It might involve practical care activities like helping children get ready for the day in the morning or playing games, sports, and helping older children with their homework. Once a week, you will meet with Projects Abroad staff to discuss your activities, and if you have any questions of ideas, you can discuss them at these meetings. You can join the General Care Project in Ecuador for three weeks if you don't have time to join us for four weeks or more. This project has been selected by our local colleagues as being suitable for shorter durations for both the host community and the volunteer. Although you will gain valuable cultural insight and work intensely within the local community please be aware that you may not be able to make the same impact as someone participating for a longer period. 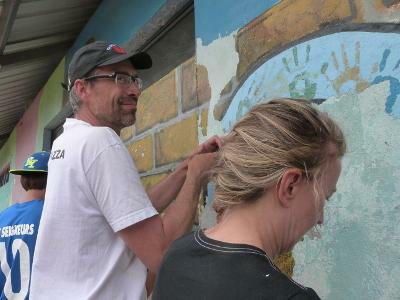 While you’re in Ecuador, you might also consider joining a 1 week Conservation & Environment Project. For more information, please visit our Galapagos Island Conservation & Environment Project in Ecuador page. Our Combinations Page explains how you can combine not only projects, but also destinations.